Costa Rica was the first country in Central America to cultivate coffee, which has been a driving force behind the development of the national economy for nearly two centuries. 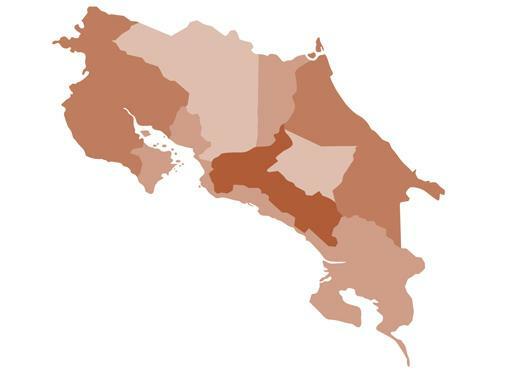 Costa Rica has exacting environmental standards, and 25 percent of the country is under environmental protection. Volcafe is continually working to strengthen its sustainable operations, and Volcafe Costa Rica’s mills are among the most efficient in the country. They’ve greatly reduced water usage, decreased energy use by 15 percent and produce biogas to use as fuel, alleviating firewood use. Volcafe owns three wet mills to process coffee from the West and Central valleys — the Los Santos and Brunca areas. The Los Santos mill, which serves Tarrazú and Tres Ríos, is the largest private wet mill in the country. Recently, Volcafe leased a fourth wet mill to accommodate its growth and to process Naranjo coffee from the West Valley. Also known as Los Santos, this southwestern region is a sanctuary to incredible birds and forests and produces the country’s highest-quality coffees. Sheltered by the Pacific Basin range, coffee is mostly shade grown in small valleys and on mountain slopes at altitudes of 1,200 to 1,900 meters. Tarrazú’s combination of altitude, climate and variety help to create coffees with good body, bright acidity, excellent aromas and intense chocolate flavors. In southern Costa Rica, this region is home to the two youngest coffee-producing areas: Coto Brus, bordering Panama, and Pérez Zeledón. At altitudes up to 1,700 meters, producers grow coffee protected by agroforestry systems that use organic materials to enrich the soil. The proximity of the Brunca mill allows processing to begin quickly, producing high-quality coffees that are characterized by an excellent aroma, body and acidity. The region’s volcanic soils are exceptionally suited to growing high-quality Arabica, and well-defined dry and rainy seasons allow producers to pick perfectly ripe cherries during the beginning of the summer season and use the rest of the summer to uniformly dry the beans. At altitudes up to 1,600 meters, the West Valley is known for coffee with good acidity, body and a balanced cup.